You've got a business colleague who's hostile...a client who's furious...a staffer who's deeply cynical-how do you get people to do what you want in tough situations like these? 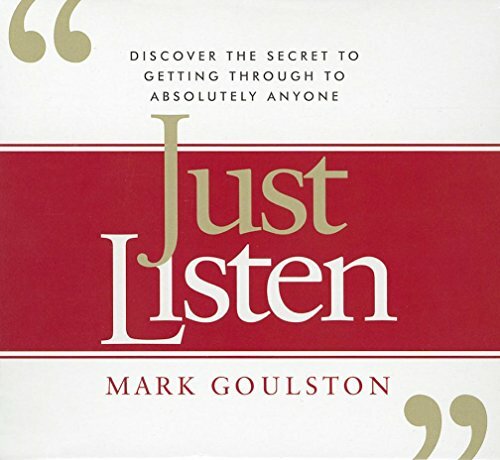 In Just Listen, veteran psychiatrist and business coach Mark Goulston reveals the secret to how to get through to anyone, even when productive communication seems impossible. But the good news is that there are simple strategies that can make you compelling, and break down the walls that keep you from getting through to the people you need to buy into your ideas and goals. Just Listen presents remarkably effective tools and techniques you can use whenever a job, a sale, or a relationship hangs in the balance. How effective are Mark's techniques? One of his areas of expertise is training FBI and police hostage negotiators to handle life-or-death situations. �The same tips I teach these profes- sionals for building empathy, de-escalating conflict, and gaining buy-in will work in any situation,� Mark says. �Whether you're a new employee fresh out of school, a salesperson, or a CEO, once you master these skills you can take them wherever you go in your career.� And Mark has proven these strategies in his own 30-year career as a business coach at companies such as GE, IBM, Goldman Sachs, Kodak, Federal Express, Hyatt, and Disney.
? Get the attention of a total stranger who you need to know-like that potential client you absolutely must land.
? Talk an angry person up from an instinctual (irrational) state to receptivity, and finally to rationality-a skill that can save a job, a marriage, or even a life.
? Use the �Magic Paradox�-a technique the author developed for hostage negotiators- to turn a negative person into an asset. Barricades between people become barriers to success, progress, and happiness; so getting through is not just a fine art, but a crucial skill. Just Listen gives you the techniques and confidence to approach the unreachable people in your life, and turn frustrating situations into productive outcomes and rewarding relation- ships. View More In Communication & Social Skills.